Their slogan is Orthodoxy or Death. They are convinced Russia should be ruled by an autocratic monarch. They believe the coming of a new tsar may be imminent. 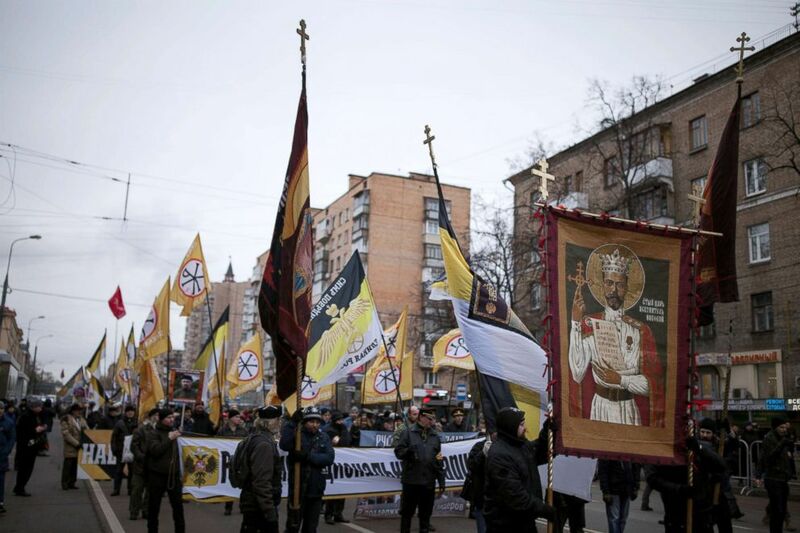 The Union of Orthodox Banner Bearers is a small fringe group of Russian nationalists with no political power that stages processions, rallies and even burns books to promote their views. 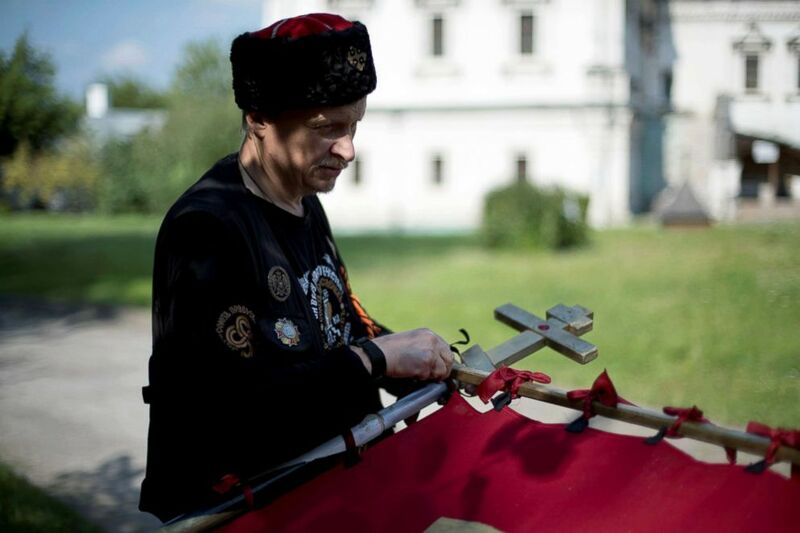 Valeriy, a member of the Union of Orthodox Banner-Bearers, prepares a banner for a morning procession to commemorate 100 years since the killing of Tsar Nicholas II, in Spaso-Andronikov Monaster y, in Moscow, July 17, 2018. Clad in all-black and marching with their Orthodox banners, the group pairs a biker club's aesthetic with the gold of religious icons. Members of the Union of Orthodox Banner-Bearers attend a march of the Unity of Nation in Oktyabrskoye Polye, Moscow, Russia, Nov. 4, 2017. "We are striving for the restoration of an autocratic monarchy. Like the one we had under our tsars," Leonid Simonovich-Nikshich, the group's white-bearded leader, said. "It is only possible through the church. In no way is this possible in a political secular way because that would be a dictator," he said. 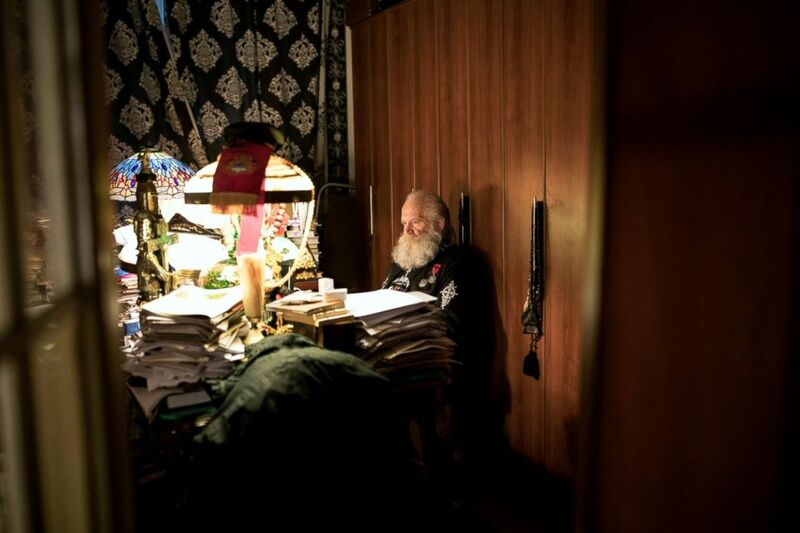 Leonid Simonovich-Nikshich, the head of Orthodox Banner Bearers, works on an article in his office at his home in Moscow, July 19, 2018. 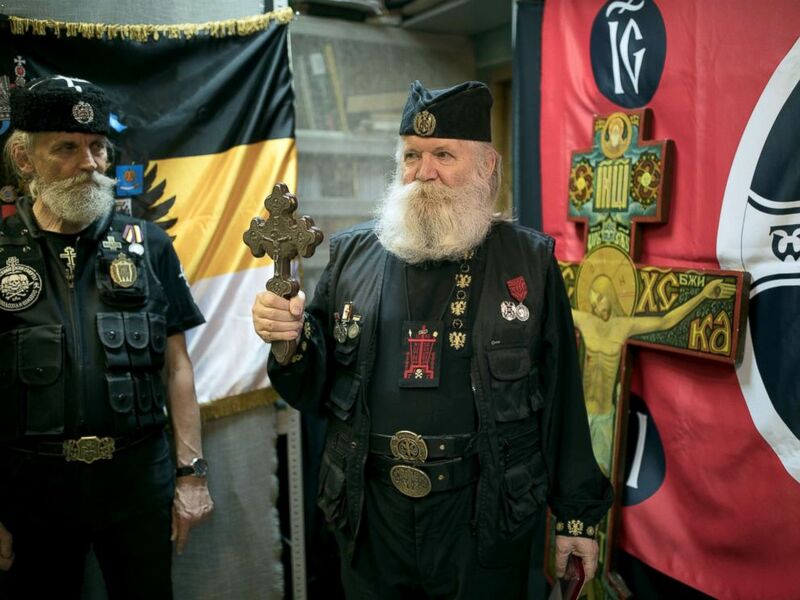 Igor Miroshnichenko, a member of the Union of Orthodox Banner-Bearers, stands inside his studio in Moscow, July 12, 2018. Its leaders say they are unsure how a shift to a monarchy might come about, with some members seeing the change emerging from a bloody social convulsion and others simply praying for it to happen. Ultra nationalist politician Vladimir Zhirinovsky has referred to Russia President Vladimir Putin as a modern-day tsar, but the Orthodox group's political allegiances are unclear and it is not suggesting that he head an autocratic monarchy. 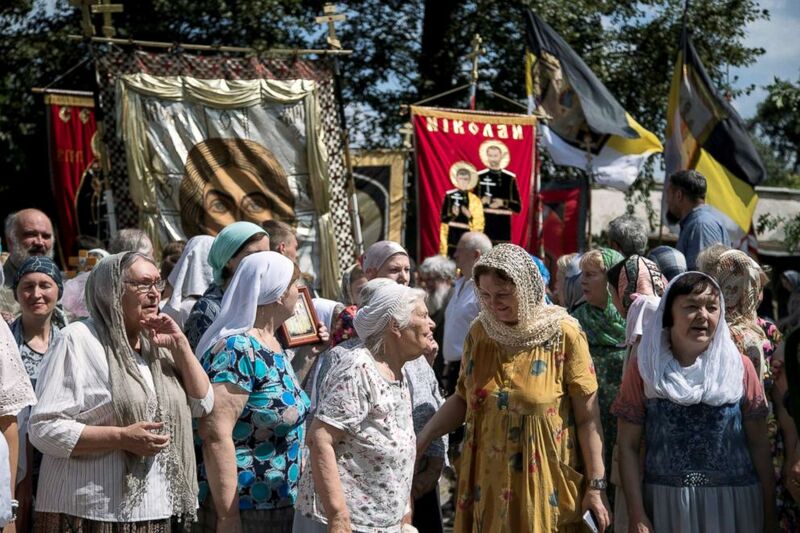 Local churchgoers attend a procession organised by the Union of Orthodox Banner-Bearers to commemorate 100 years since the killing of Tsar Nicholas II, in Spaso-Andronikov Monastery in Moscow, July 17, 2018. The group held a religious procession at a monastery in Moscow last month to mark one of the mo st important recent dates in their calendar: the 100-year anniversary of the murder by the Bolsheviks of Russia's last monarch, Tsar Nicholas II. The tsar, his wife and five children were shot on the night of July 16 to 17, 1918, in the basement of a merchant's house in the city of Yekaterinburg, 900 miles east of Moscow. 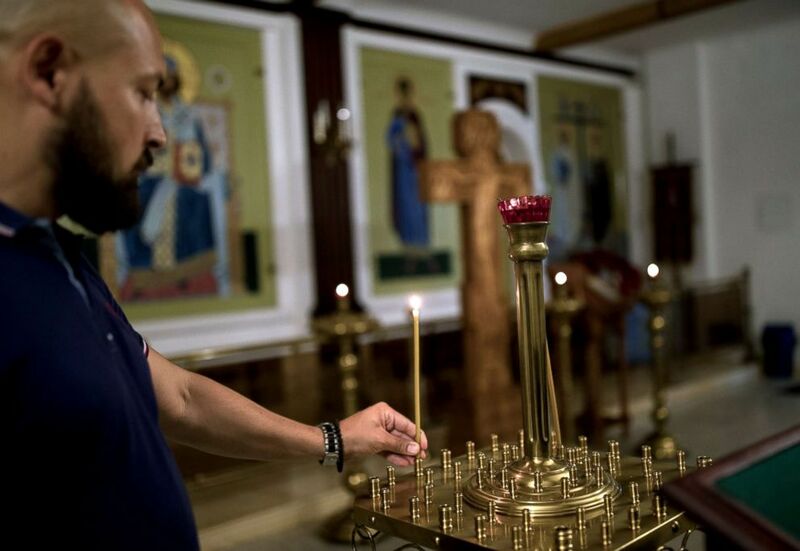 Denis, a member of the Union of Orthodox Banner-Bearers, visits the church inside TV and Radio Broadcasting Centre Ostankino where he works, during a break, in Moscow, July 18, 2018. 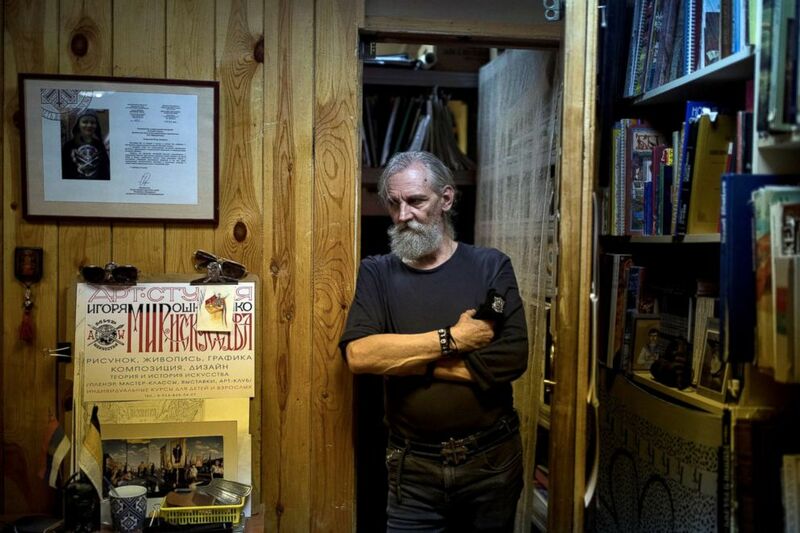 Pawel, a member of the Union of Orthodox Banner-Bearers, sits in his bedroom where he keeps a collection of icons from the monasteries he has visited, in Solnechnogorsk, July 19, 2018. After the collapse of the Soviet Union and the state atheism it espoused, the church canonized the tsar and his family, and his popularity as a historical figure has grown amid a Russian Orthodox Church resurgence under Putin. Russian religious conservatives last year waged a campaign to block the release of Matilda, a Russian movie the Union of Orthodox Banner Bearers described as blasphemous for its depiction of a romance between the tsar and a young ballerina. A woman with an image of Virgin Mary on her back attends a march of the Unity of Nation in Oktyabrskoye Polye in Moscow, Russia, Nov. 4, 2017. The group did not attend the main memorial event in Yekaterinburg to mark the centenary of his murder, however. It was told it would not be allowed to raise its standards -- some of which feature skulls and radical slogans like Orthodoxy or Death -- at the event, Igor Miroshnichenko, a member of the group, said. 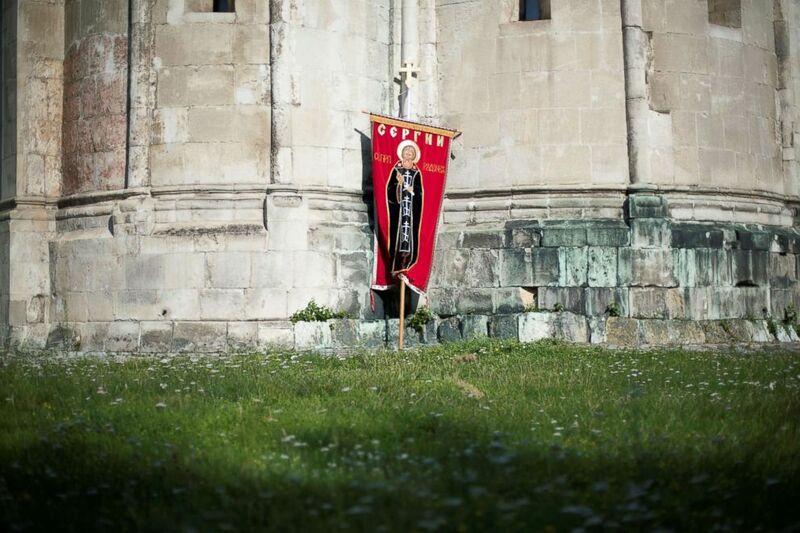 A flag belonging to the members of the Union of Orthodox Banner-Bearers is seen at Spaso-Andronikov Monastery during the preparation for a procession to commemorate 100 years since the killing of Tsar Nicholas II, in Moscow, July 17, 2018. Instead, the group gathered at the Andronikov Monastery of the Saviour in Moscow on July 17 where they marched with tall crosses and standards depicting Russia's last tsar. Leonid Simonovich-Nikshich, right, head of the Union of Orthodox Banner-Bearers, and Igor Miroshnichenko, his deputy, prepar e for the award ceremony at their headquarters in Moscow, July 12, 2018.